Dou ban jiang is a spicy, salty paste made from fermented broad beans, soybeans, salt, rice, and various spices. Dou ban jiang exists in plain and spicy versions, with the latter containing red chili peppers and called la dou ban jiang (là meaning "hot" or "spicy"). Left: Spicy dou ban jiang. It is used particularly in Sichuan cuisine, and in fact, the people of the province commonly refer to it as "the soul of Sichuan cuisine". A particularly well known variety is called Pixian dou ban jiang, named after the town of Pixian, Sichuan. This sauce is sometimes stir-fried with oil and eaten with rice or noodles as a quick meal, and is also commonly used as a primary flavoring for fried tofu dishes and cold tofu salads. It is also frequently mixed with instant noodles to improve the flavor of the usually MSG-laden noodles. In many Chinese communities and food factories, dou ban jiang is produced with only soybeans and salt, and does not contain the broad beans or chili peppers typical of Sichuan style dou ban jiang. 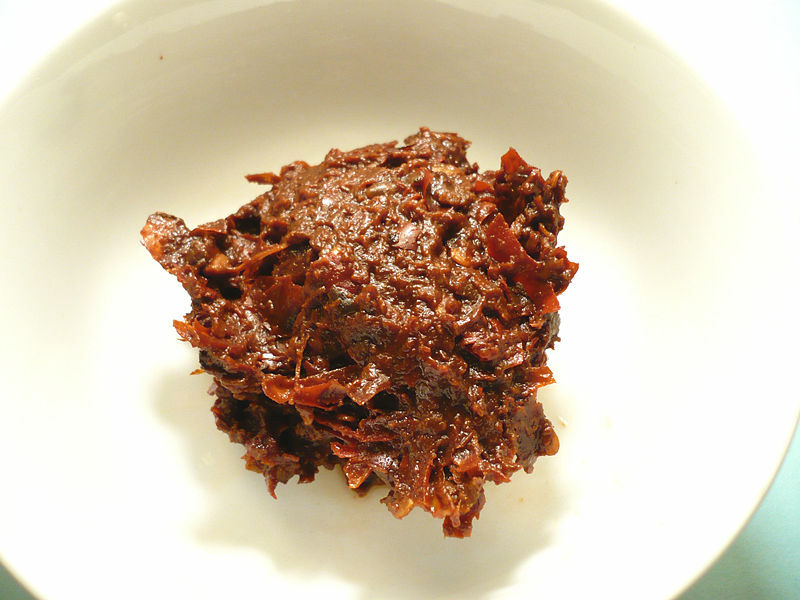 In Korean cuisine, a similar form of hot bean paste is called gochujang.